Stepping up her anti-Centre tirade, West Bengal Chief Minister Mamata Banerjee on Monday said she had met Prime Minister Manmohan Singh several times to protest against fertiliser price hike but to no avail, and she could not do anymore. “I have met the Prime Minister 10 times. I cannot do more than this. Shall I go and beat (him up)? Then you will say I have become a ‘goonda’. Without doing anything I am (called) a ‘goonda’. I do not mind that. But I know the way out. We will have to set up a fertiliser factory and it will need three or four years’ time,” Banerjee said. She said the central government was pursuing “anti-people” policies like FDI in multi-brand retail and diesel price hike. “We cannot allow FDI in retail and other anti-people decisions like repeated hike in the diesel prices and the cap on LPG cylinders,” Banerjee, whose party Trinamool Congress had quit the government in September last year over these issues, said. The West Bengal Chief Minister claimed that the Congress-led UPA would go in for a snap election in the middle of this year. “They would go for an election in August-September this year. There will be no implementation of the forthcoming Union Budget (budgetary proposals which will be placed in Parliament),” Banerjee said. 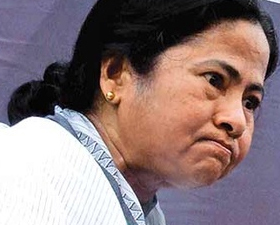 The Chief Minister threatened to “take the fight for Bengal to the streets of Delhi” if the Centre did not respond to her demand for a three-year moratorium on repayment of past debts and interest on them. “When the Left Front government was in power, it was allowed to take loans. I am going to wait for some more days. If the Centre does not accept our demand (for a moratorium and debt restructuring) I will be forced to take the fight for Bengal to the streets of Delhi,” she told the rally. On the Centre’s subsidy for different central projects and Congress leadership’s claim on helping the states through central projects, she said, “If they are showing mercy through these (subsidised schemes), whose money is this? Is it your money or my money? It is the money of the states”. Banerjee said the Centre was taking Rs 40,000 crore per year on account of various taxes from which Rs 18,000 was being given to the state from the central pool. “However, another Rs 26,000 crore is being taken away from the state in the form of debt and interest repayment on central loans,” she pointed out. Slamming the UPA government over FDI in retail, hike in diesel prices, non-subsidised LPG and fertiliser price hike, she said, “This government will have to pay the price for setting the kitchens on fire”. She said if the Left Parties and the BJP had responded to her request and supported the no-confidence motion moved by her party, “then there would have been a fall of this government and (UPA-II) could not put pressure on the people”. “But unfortunately they (parties) did not pay heed to our call and like the Royal Bengal tiger, Trinamool Congress is one party which has the guts and did not care for the ministerial positions or anything when safeguarding interests of the people,” she said. The Chief Minister said she supported the issues on which the Left and other trade unions have called a country-wide industrial strike on February 20 and 21 but would not allow observance of any bandh or blockade on those days in West Bengal for this. Banerjee, who has decided that Trinamool Congress would go it alone in the crucial Panchayat elections due in May this year, said Congress and CPI(M) were trying to team up against her party, but they would not succeed. She said she would not allow any communal riots and alleged that “The Congress, CPI(M) and BJP were trying to foment troubles.” She said that a section of the media, which is spreading canards against her government on different issues, was also spreading rumours abroad that CPI(M) would return to power. “I am saying that they will not come back to power in 30 years,” she said.